The Seychelles is an island republic that consists of 115 islands, 30 of which are inhabited. 30% of the islands are granite (volcanic origin), while the remaining islands are coral atolls. Mahe is the principal island of the group and home to the capital city, Victoria, which has the distinction of being the smallest capital in the world, with a population of 26,000 (the whole country’s population is only 91,000). The primary language here is a very Africanized form of Creole; French and English are also taught in school and commonly used. Based on what we saw, the standard of living here is higher than it is in many of the places we have visited. They depend a lot on tourism for their income. Most of the people who vacation here come from Europe. The cruise ship business has decreased significantly since the advent of serious piracy. We learned that the pirate trials and imprisonment occur here; some of the worst offenders are sent off to a place reminiscent of Alcatraz. 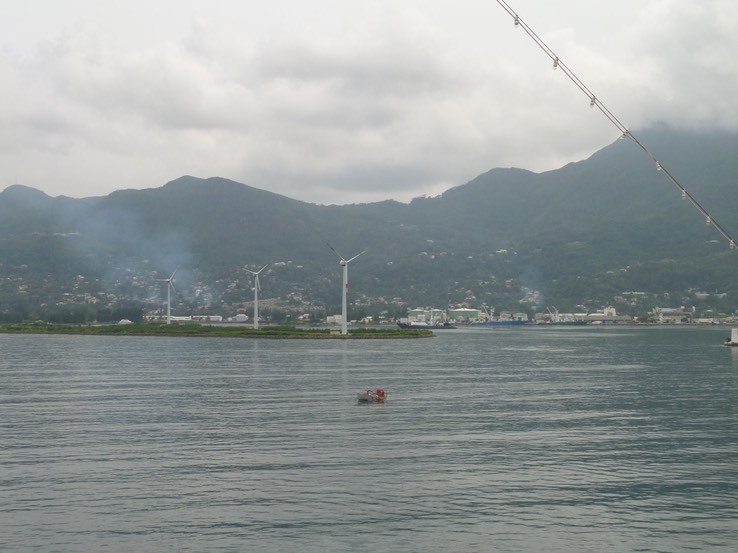 We docked around 3:00 PM on the day we arrived, which gave us time to go ashore and walk around a little bit. We walked about a mile from the pier and discovered a park which had a children’s playground and a tidal pond which contained a concrete ship (the LIBRA) and a lot of snails and hermit crabs. The tour began with a short walking tour of downtown. We visited a market. One highlight of the market was some birds (several egrets and a gray heron) who apparently know they can get a handout from the fish vendors in the market. This market wasn't as large as many we have seen but it was a genuine daily market with fresh food for the people of Victoria (and some of the birds and a cat). Oh yes, they also had souvenirs available for tourists. At one point Susan noticed a large web overhead between a nearby tree and the roof of the market on which there were perhaps 8 or ten very large Palm Spiders (well, the females were large). Carina (our guide) said that the males, much smaller than the females, were eaten after mating. She was fond of the saying kahuna matata which means “the circle of life” (from The Lion King). Not sure how the male palm spiders feel about that but …. From the market we walked a bit more and saw another interesting vestige of British Colonial presence. In a nearby intersection stood a small clock tower which was silver in color and was a pretty good replica of Big Ben (London’s famous clock near Parliament). Then we re-boarded the bus for a tour around the northern peninsular part of the island. (The entire island is only about 5 miles east to west and 18 or so north to south.) When we reached the west side of the island we proceeded to Beau Vallon Bay which has beautiful beaches and hotels. We visited one hotel for a beverage and a beach break. We tried one of the local brews, Sey Brew. It was a decent beer. Quite nice for the hot humid weather that is common here. After beer and beach we re-boarded the bus for a trip across the more mountainous part of the island back to Victoria. Just on the south edge of town is the Botanic Garden. We stopped there for two main things. Number one and one of Susan's bucket list items was the Coco de Mer. This is the biggest nut in the world. (No wise cracks about either of us rivaling the Coco de Mer for that honor please!) This grows on a palm tree but is huge. It can reach sizes approximately twice that of ordinary coconuts. The Coco de Mer is endemic to the Seychelles. It's name came about because the first Europeans to see one found it in the Indian Ocean. They could not figure where it had come from so they just called it coconut from the sea, Coco de Mer. If you remove the husk it resembles a twin coconut. 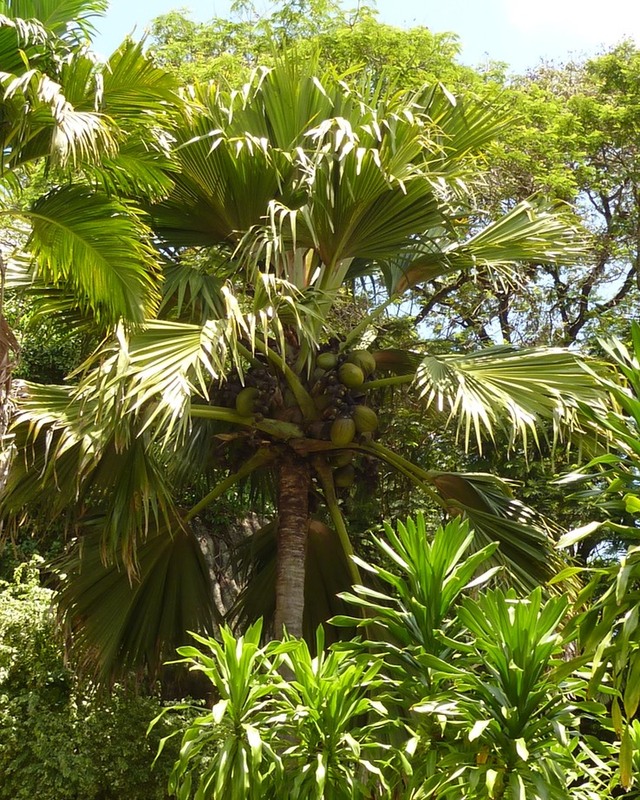 When in their husks, the coconuts look very much like large regular coconuts, but the leaves on the tree are fan-shaped as opposed to the feather-shape of the leaves of the regular coconut. Another distinguishing feature of the Coco de Mer is that it has separate male and female trees. The young trees are about 15 years old before they can reproduce, and the fruits take a long time to develop and mature. The second attraction at the garden is the Aldabra giant tortoises. These giant turtles are majestic in many ways. Our guide described them as moving rocks because they move so slowly. They live as long as 140 years! They have no natural predators on the islands.